"This is an extremely simple and quick recipe which produces marvelous results! Garlic is mashed and placed into the rice cooker with some chicken for flavour. 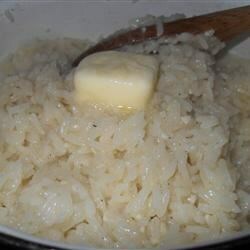 The result is the extremely fragrant garlic rice to die for! Delicious by itself, even better with some chicken!" Place rice, water, sesame oil, chicken bouillon, olive oil, green onion, garlic and ginger in a rice cooker. Stir, and then place chicken thigh on top. Turn on rice cooker. When the rice is done, mix the rice so that the oil will be evenly mixed with the rice. Serve. Spicy island flavors infuse this summer chicken dish. Sounds yummy and super easy, but stupid question: Is the chicken thigh supposed to be cooked before you put it in the rice cooker, or is it raw when it goes in and cooks with the rice?